Join us on Friday, February 8th for our third annual Beer & Cheese event. 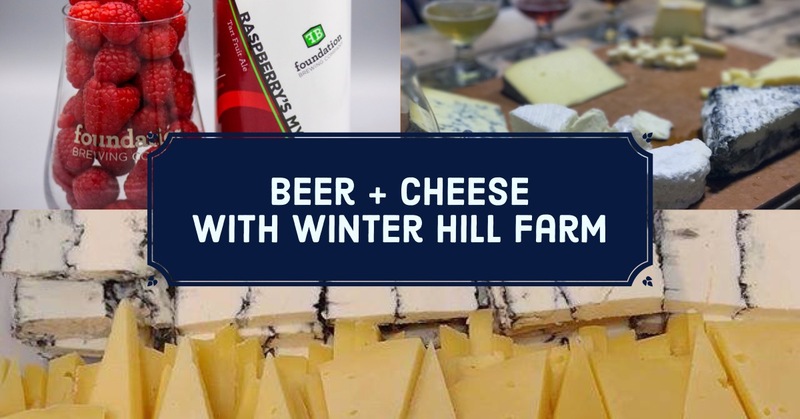 Winter Hill Farm will be joining us with five cheeses paired with our beers. The pairings will include a broad variety of beer styles, giving you the opportunity to see the range of flavors that can be paired with cheese. This open brewhouse event is not just an experience for you to enjoy great cheese and beer but also a great way to learn what beer and cheese can do for one another. Each stop throughout the brewery will have a member from the Foundation team to discuss how the two interact with each other. The tour will spread throughout the brewery, including our barrel room. Tickets include five portions of cheese paired with five 4-oz pours of Foundation beers. This is a ticket-only, private event with a limited amount of tickets available. Ticket sales close at 10pm on the day before (Thursday) to give the cheesemaker time to prepare all the cuts of cheese for the event. TICKETS AVAILABLE in the Tasting Room or on Eventbrite. $35 per person includes 5 pairings. © 2019 Foundation Brewing Company | This website is intended for individuals of legal drinking age only.